A neat aluminium extrusion complete with frosted diffuser used with one of our many LED ribbons makes a bespoke light strip. 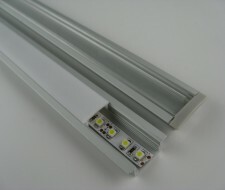 The aluminium extrusion is available either as surface mounted or recessed (waterproof version available) and comes complete with end caps (one has a hole for the power cable) and fixing brackets for the surface mounted extrusion. Comes in 1m lengths - this extrusion can easily be cut to fit any application or multiple lengths can be used to make a longer linear length.